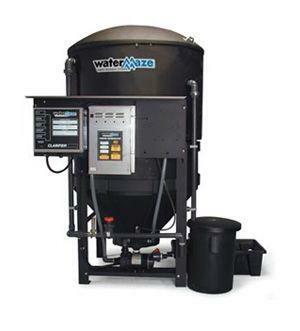 Water Maze CL and CLT clarifier systems are modular components that can be applied as pretreatment, post-treatment, or as a stand alone treatment system. All units utilize cross-linked polyethylene cone-bottom tanks with steep slopes (up to 55 degrees) for maximum solids separation. Each tank has a full open top with removable lid and includes heavy duty metal stand with cradle. Each model provides features and benefits to match your application requirements. The Filter Pac III module attaches to the CL-603 to create total wash-water recycling systems. Designed for flow rates of up to 30 GPM, the Pac III features carbon, cartridges and media filters for recycle quality wash water.